When it comes to Christmas sweets and baked goods, I'm mostly a cookies, cakes and breads kind of girl. I know a lot of people think of fudge at Christmastime, but for some reason I've never been much of a fan. As far as candies go, there is only a short list that I like to make and give each year. Two of these I posted during the early days of my blog—Salted Mixed Nut Brittle and Chocolate Almond Toffee. In recent years, I have been making caramels. 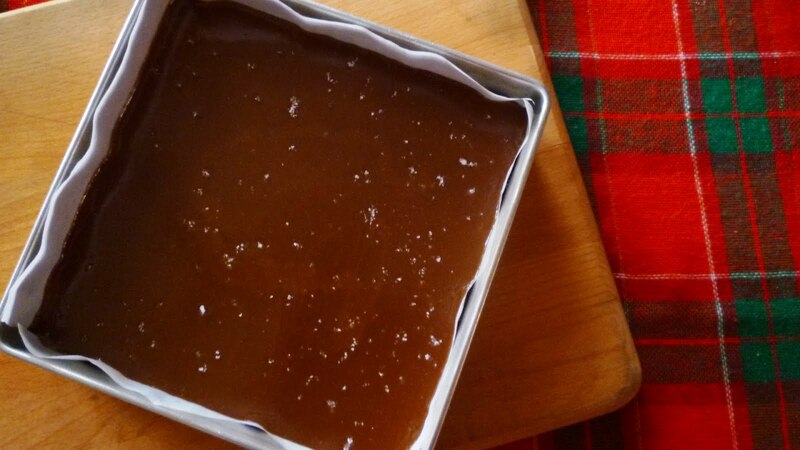 Not just any old caramels, but delicious soft and chewy, honey-scented and crunchy sea salt-sprinkled, caramels. These caramels are my combination of a couple of recipes—Honey Cream Caramels from The Sweet Melissa Baking Book by Melissa Murphy and Honey Caramels from Pure Dessert by Alice Medrich. The two recipes don't differ that much in terms of their ingredients. In fact, the ingredient list for my caramels is almost identical to the one by Murphy. It is the method that really differentiates these two recipes....and I'm using the method that Medrich uses. 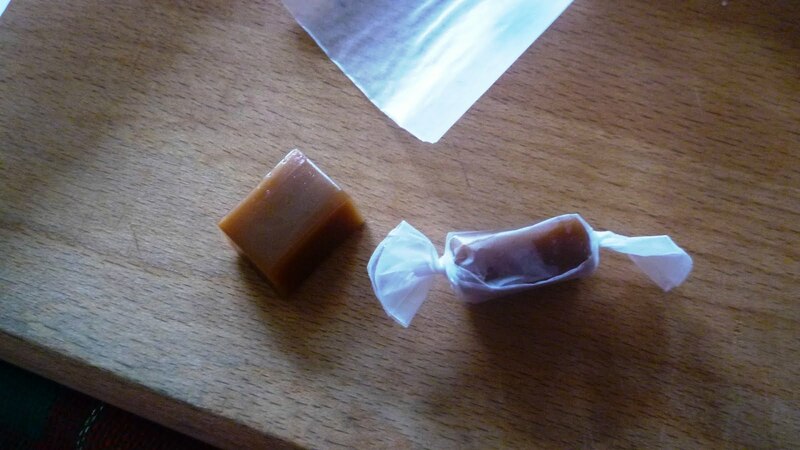 These different methods are a perfect example of a great divide in the world of caramel making. 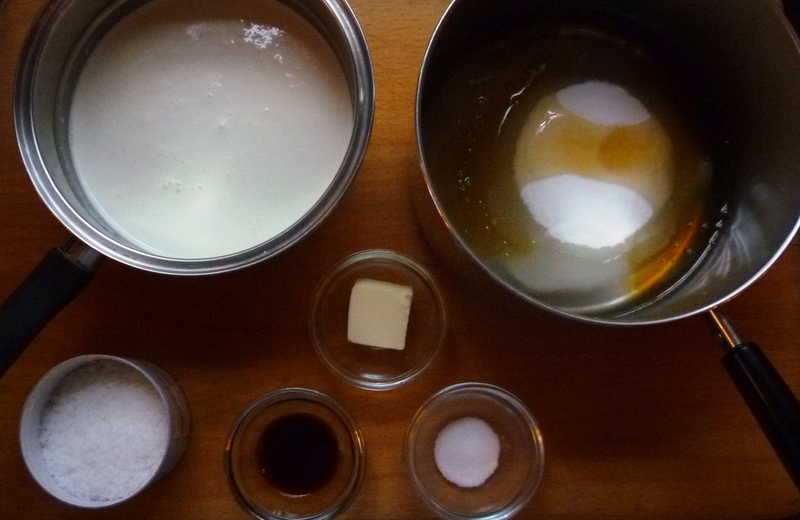 The Sweet Melissa recipe uses what I would call a "one step" process: all of the ingredients (sugar, corn syrup, honey, cream and butter) are placed in a pan together and cooked to the firm ball stage. 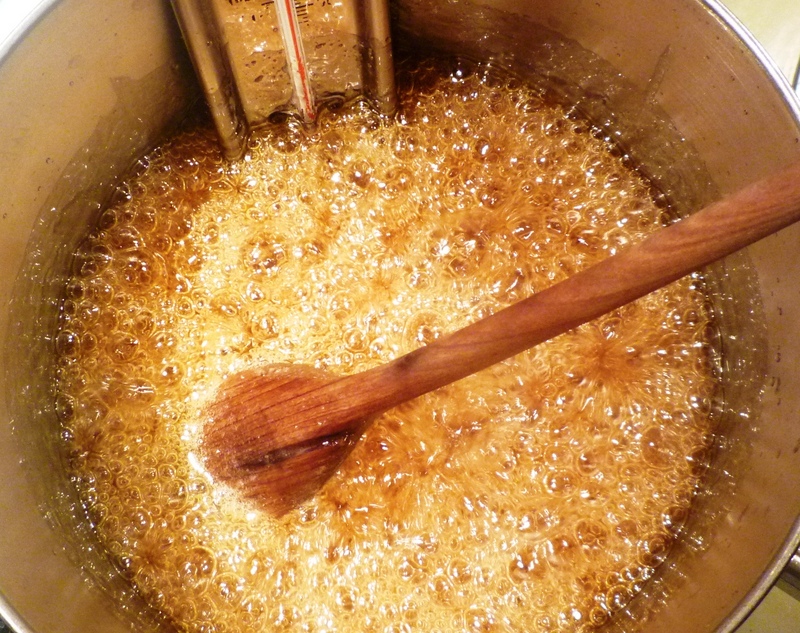 Medrich's recipe uses two steps: the sugars and syrups (honey and corn syrup) are cooked first to the temperature at which sugar caramelizes. At this point the cream and butter are added. The mixture is then cooked some more until it reaches the firm ball stage. Since the mixture reaches the firm ball stage at around 250° F...and sugar caramelizes at 320° F...it seems to me that the one step method (where the temperature never reaches the carameliztion point) doesn't technically produce something that can be called a "caramel". Obviously not everyone agrees with me...and you will find many recipes for caramels that employ this method. 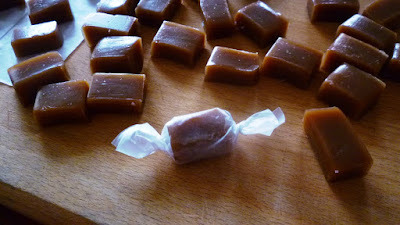 However, I have made these caramels using both methods and feel pretty confident in saying that the two step method produces a superior caramel...at least, with this recipe. In the interest of full disclosure, I should point out that honey begins to caramelize at a much lower temperature than granulated sugar (230°, to be exact). Of course both the methods I have described reach this temperature. 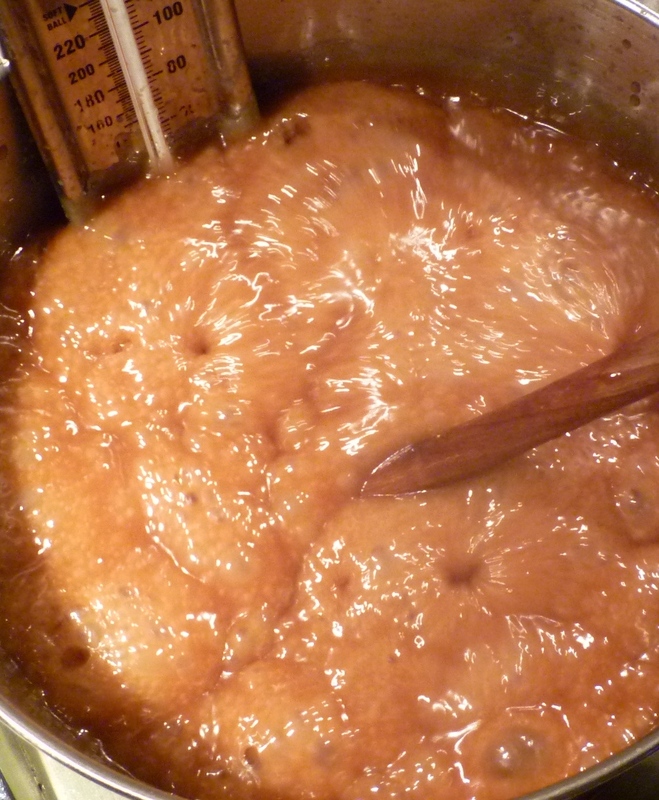 So in fact, for honey caramels, there is some degree of caramelization that is occurring even if you are only using the one step method. Even so, I prefer the deeper caramelization that is achieved by taking the sugar syrup to the caramelization point of granulated sugar (320°F). I will concede that the process of making...then cutting...then wrapping...caramels could be seen as a bit of a tedious process. But I don't see it that way at all. Rather, I see it as an opportunity to make a truly fine homemade gift for the people I love. And for the caramels that I keep for myself, the memory of the time and effort that went into the project helps me to savor each one...as opposed to just mindlessly consuming one after the other. As further incentive, the cutting and wrapping process provide a window of time when I can put a favorite Christmas movie in the DVD player and actually sit down for a while as I work. Since I am on my feet for most of the day every day, this is a welcome moment during my holiday season. 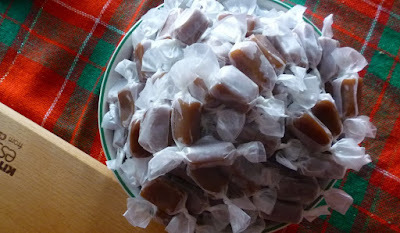 I find that the process fits my schedule best if I make the caramels and pan them up on one day, let them cool overnight and then cut and wrap them on the following day. There are a few things that will make the task of cutting and wrapping easier. First, use a sharp, thin knife to cut the caramel. Wipe the blade frequently with paper towel moistened sparingly with vegetable oil. If any caramel becomes stuck to the knife, scrape and wipe it off completely before the next cut. 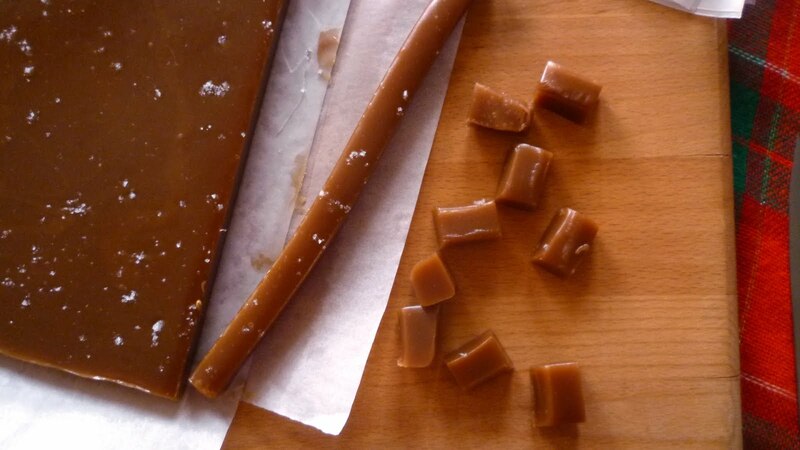 If you have successfully taken the caramels to 250°, the cut caramels will hold their shape long enough so that you can cut them all and then wrap them all. If you have undershot the mark at all (and produced a softer caramel), it is possible that they will begin to slump and spread as soon as they are cut. If this is the case, it will work best to cut and wrap them in small batches. Make sure that the freshly cut caramels don't touch one another. They will stick to each other and you'll have to cut them apart. Finally, I have always cut my own squares of waxed paper wrappers. I like to make small caramels and am able to cut the papers to the exact size that I want this way. But I admit this is the part of the process that I enjoy the least. If you don’t want to cut your own, you can purchase pre-cut candy papers from a bakery supply house or an on-line purveyor like Amazon. 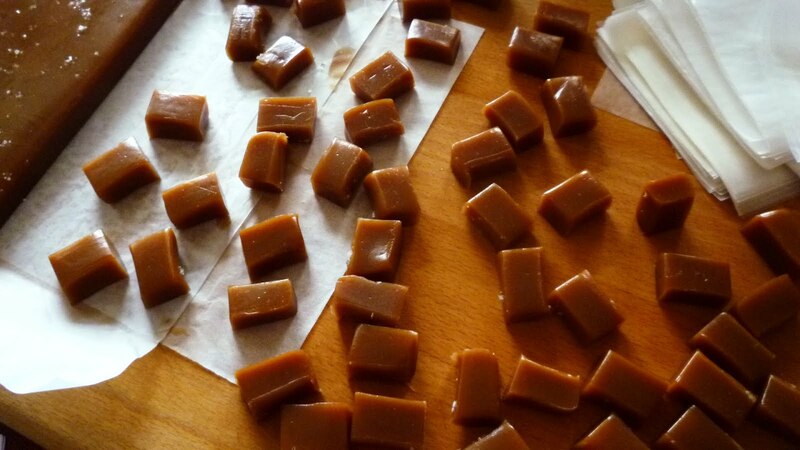 If you have never made candy of any kind before, making caramels is probably not where you should start. The process requires that you pay close attention to all the small details of the candy making process...temperature, making sure all the sugar crystals are dissolved, etc. Furthermore, it really is best if you have an experiential knowledge (for safety's sake) of the volatility of hot sugar syrups. Of the three candies I have posted thus far, I would say that the mixed nut brittle is a good beginner recipe. Brittle is a simple "one step" process, and in that particular post I have discussed in detail the importance of making sure all of the sugar crystals have been dissolved. 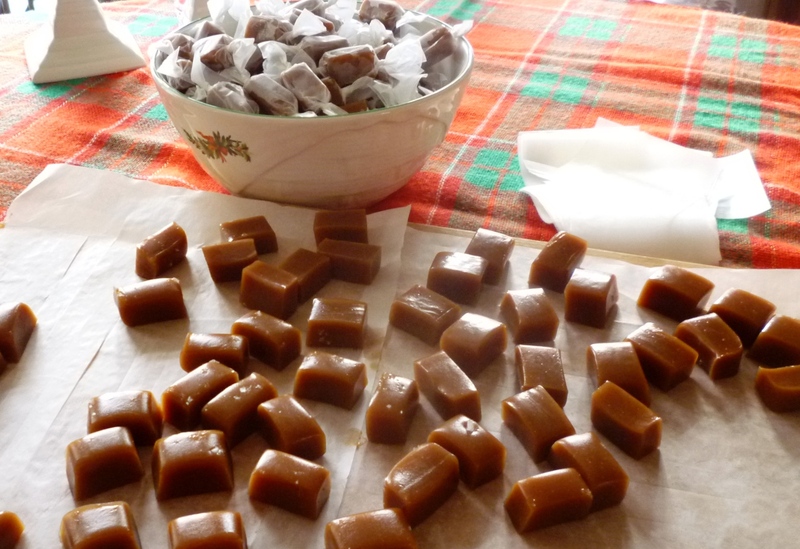 Toffee is a good second recipe. It is slightly more detailed...and slightly more persnickety...than brittle, and in that post, I talk a little bit about safety in candy making. Making all three of these...first brittle, then toffee, then caramels...would be a great short course in candy making...and would of course produce lots of delicious treats for you and your friends and family...just in time for the holiday. Line the bottom and sides of a 9-inch square, straight-sided metal baking pan with two long sheets of criss-crossed parchment. Spray lightly with spray release (“Pam”), or brush lightly with vegetable oil—use a paper towel to blot away any excess spray or oil. Sprinkle sparingly with fleur de sel or other coarse sea salt, if you like. Set aside. Heat the cream in a small saucepan until steaming hot. Remove the pan from the heat and cover to keep the cream hot. I think 320° to 325° is optimal for the best flavor and color. It will take about 10 minutes to reach this point. If you prefer a lighter caramel, you can stop at 305°. Don’t go beyond 330°. Remove the pan from the heat and stir in the butter. Gradually stir in the hot cream. Be careful, it will bubble up and steam dramatically. 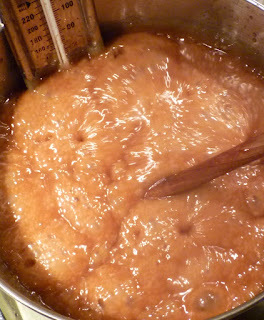 Return the pan to medium to medium-high heat (regulate the heat so that the caramel cooks at a vigorous boil.) and continue to cook, stirring constantly, until the temperature reaches 250°F—about 15 minutes. Remove the pan from the heat and stir in the salt and the vanilla. Pour the caramel into the lined pan. Sprinkle the surface with more fleur de sel. Let set until firm—at least 4 to 5 hours…overnight if you have time. Loosen the edges with a lightly oiled knife. Lift the caramel from the pan using the overhang of parchment. Cut the caramels with a thin and sharp oiled knife into any shape or size you desire. 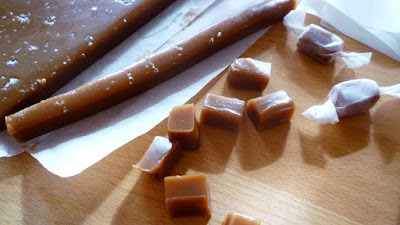 Wrap each caramel individually in waxed paper. I prefer small caramels, so I cut the large square of caramel into 16 half inch strips and then cut each strip into 9 one inch lengths. A 3- by 3 1/2-inch rectangle of waxed paper is the perfect size for wrapping these small caramels. This size will yield 144 (12 dozen) small caramels. Thanks Katrina! Caramels are tricky....just a small window between soft and gooey (and not set at all) and caramels that are hard enough to damage your fillings! Are you making a two stage caramel (taking the sugars/syrups to the caramelization point before adding the rest of the ingredients and then boiling it again until it reaches the firm to hard ball stage)?...or just boiling everything to the firm/hard ball stage all at once? The really high temperature (over 300) is to caramelize the sugars...and honey caramelizes well below that. If you like the flavor, I would say the caramelization of your sugars isn't what's tripping you up. I would say you just need to play with the final temperature. At my altitude, this is 248 (for pretty soft caramels) or 250 (for firmer caramels...which is how I like them). You will need to find a conversion chart for your altitude for those temperatures. Hope this helps! So sorry you haven't been feeling well... 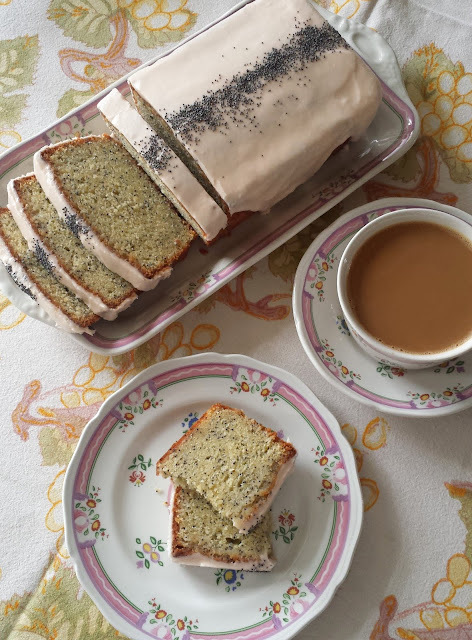 I know how much you like to cook/bake and blog. I hope you find the time to perfect your caramel recipe...but mostly, I hope you feel better.